I had a rather explorative start to 2017, with a couple of nice urbex trips early on. First one was a long trip down South to visit Sleaford Bass Maltings. We didn’t get in, but we did find Rauceby Hospital as an alternative, which turned out be a good explore. Following Rauceby I visited Cheadle Royal. It’s not big and there’s practically nothing to see, but it was a good trip and I got some really nice pictures, so worth a visit in my eyes. February saw me join the ranks of the #ThisGirlCan campaign when I took part in a climbing photoshoot at Manchester Climbing Centre. I had a fantastic day and met some amazing people. Even though I’m not very good at climbing, I loved how they wanted all different types of women, and a variety of abilities represented. Since the photo shoot, I’ve been featured on their Twitter and Instagram accounts alongside my fellow climbers and been mentioned on the BMC website. March took me on another urbex, this time to Newsham Park Asylum. Ok, so technically it was a ghost hunt for my hen party, but I really just wanted to go and explore. I also took part in the Crystal Maze experience in Manchester, which was amazing. I’ve done this twice now, and while there’s enough variety to warrant a second run, I turned down a third trip for fear of ruining it for myself by knowing too much. If they ever do a complete overhaul of the rooms, I’ll definitely be back. Ok. So. April 2017? Best. Month. Ever! Not only did I get to marry the love of my life, but we had a phenomenal two-week honeymoon in Hong Kong and Bali. Between our traditional with a twist wedding, including zombies climbing up the wedding cake, Christmas cracker favours and a drag queen we had an amazing day. We also got to spend an exciting and relaxing two weeks on the other side of the world. Highlights included Hong Kong Park, our private villa in the W Hotel in Bali, snorkelling, and an urbex of the abandoned Taman Festival Park. This also reminds me that I never actually wrote a post on my wedding, so I’ll have to do that soon! In May I began working with the Django Girls Foundations as their new Awesomeness Ambassador. I’ve done quite a bit of voluntary work, including organising Django Girls events in Manchester, but actually working for a phenomenal organisation like the Django Girls is truly special. For an idea of just what the Foundation achieves, check out the impact report we wrote this year. June was a pretty good month. It saw the start of Manchester International Festival, and Party Skills for the End of the World is still one of my stand-out events of 2017. I still listen to AK/DK in the car, and it was probably one of the few chances I had this year to dance like an idiot, which is one of my favourite things to do. In addition, I climbed my first ever 6a grade wall, which, if you haven’t been following my climbing journey, was a HUGE jump for me. July’s best moment had to be our glamping weekend and underground adventure. I still can’t believe I convinced my husband to go camping, even if it was the most adorable yurt hut I’ve ever seen. I’d love to go and stay somewhere like this again, and combined with a caving experience in an old Welsh mine it made for the perfect outdoors weekend getaway. August was a quiet month. 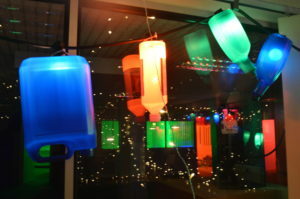 I spent time winding down from my work at MadLab and my last hurrah was running coding workshops for Makefest at the Museum of Science and Industry. While prepping for my new venture in Teacher Training, I was awarded a BCS Scholarship, which I’ve since written about for their website. The BCS Scholarship has been a huge boost to my studies and really glad I took the plunge to apply. I started my PGCE! I haven’t really written much about my studies so far. When they say that undertaking a PGCE is like working full-time with full-time studies on top, they’re not exaggerating. Life has been pretty hectic, and I’ve had to cut down on a lot of other stuff I was doing to keep up, but I’ve loved almost every minute of it, and I hope to review my experiences in Block A soon. I also helped organise workshops for National Coding Week again this year. 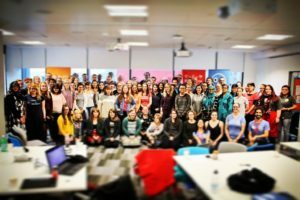 Rather than trying to run multiple little workshops on my own like I did in 2016, I instead teamed up with some of my previous co-organisers to run one big workshop combining the Django Girls and Rails Girls tutorials. The end result was outstanding, and I hope that everyone involved had a great time. October saw the return of Hack Manchester. Now I usually volunteer to help out at this event, but this time, I decided to enter a team and also take part! As part of my PGCE, I convinced two of my fellow student teachers to join me and consider the experience a CPD session. It was difficult as we’re all so busy, but in the end, I’m so pleased we decided to take part. We were probably the team with least actual coding experience there (most participants work as developers) but we were determined to get involved and push ourselves. So much so, that we won the Texecom Challenge! 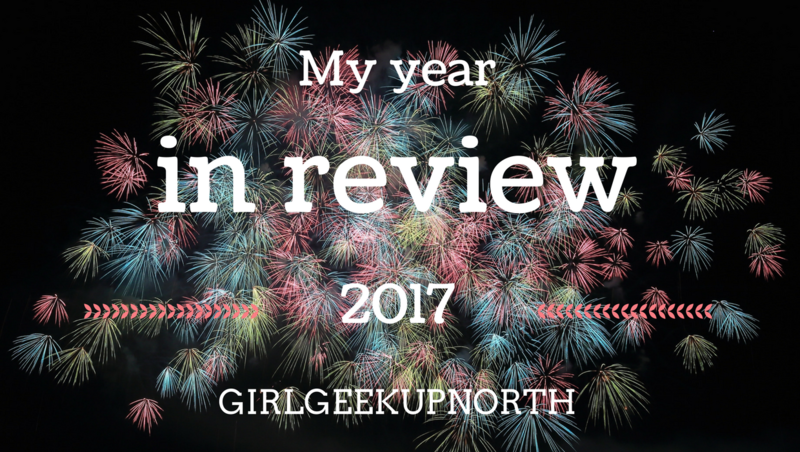 November was knuckle down with my studies and teaching practice month, so very little happened on my blog. To keep things ticking over I wrote a few posts on the Royal Society’s reports on the new Computer Science curriculum. As this is the subject I’m training to teach, the results of this report really affected me. Things weren’t great, and the report highlighted how much teachers need support in teaching this subject. This also prompted me to write a post detailing the best CPD I’d found, in the hope that it would help other teachers. I literally haven’t done anything interesting in December. I did pass my Block A placement though and make a good start on my Inclusive Learning Assignment, but December was mostly work-study-work-study-food. I think my aim for 2018 is to keep writing, even if it’s just short posts here and there. I have so many things to write about, and not enough time to do it!